CIF Director of Housing suggests in 28 working days, on 1st March self-build will no longer be possible. A recent Podcast on Radio Kerry: David Moriarty Architect and Hubert Fitzpartick of the Construction Industry Federation (CIF Director of Housing) discuss Building Control (Amendment) Regulation (SI.9 of 2014). A competent builder is noted as someone with a track-record (tax compliant, experience in doing similar projects etc). An owner must appoint a builder at the outset who will sign a completion certificate on completion of the project. The CIF also note the provision for registration of builders coming down the tracks. Build costs will increase and this may lead to some difficulties, particularly for self-builders. The Minister has now confused the matter by saying that there is “no restriction on whom an owner may assign as a builder once the owner is satisfied that the builder is competent to undertake the works involved.”By definition most self-builders will not be “competent” in accordance with the standards adopted by the CIF and supported by the the minister’s department. There is no possibility that they can comply when the CIF’s register is formally adopted as part of the statutory process. The above opinion piece was submitted by Maoilíosa Mel Reynolds on 31st January 2014. Political Q+A: Mark Daly: Professionals concerned over Building Regulation (Amendment) Regulation (SI.9 of 2014)? I thank the Minister for coming to the House. This issue relates to the new 2013 regulations introduced under the Building Control Act, and they relate to certification of building works. There seems to be much concern among architects, engineers and surveyors regarding the exclusion of large numbers of competent engineers and architects who currently do a job in applying for planning permission and supervising construction works. It now seems that those who have been deemed competent for decades and who have been in the industry for years will not be able to certify works under these regulations. Will the Minister outline what is being done to allay their fears? People’s lives and livelihoods – their ability to earn a living – are being put at risk. I am glad of the opportunity to outline the position for Senator Daly. The new Building Control (Amendment) Regulations 2013 will strengthen the arrangements currently in place for the control of building activity by requiring greater accountability in compliance with building regulations in the form of statutory certification of design and construction, lodgement of compliance documentation, mandatory inspections during construction and validation and registration of certificates. The new regulations are necessary following the widespread instances of failure by owners, designers and builders to comply with their statutory obligations under the Building Control Act 1990 to design and construct buildings in accordance with the building regulations. An extensive public consultation process was undertaken in 2012 to inform the development of the revised building control regulations which will come into effect on 1 March 2014. Comprehensive consultation documents were published, including Strengthening the Building Control System, a document to inform public consultation on draft building control (amendment) regulations 2012 which sets out the context in which the reforms – which are now signed into law in the form of SI No. 9 of 2014 and which supersedes SI No. 80 of 2013 – will operate and the regulatory impact of these for building owners and industry stakeholders. This document remains on my Department’s website. In the two years since public consultation began, my Department has worked in close consultation with key industry stakeholders and local authorities through the City and County Managers Association to prepare for the new regulatory environment. In this regard, a new on-line building control management system will provide a common platform for clear and consistent administration of building control matters across the local authority sector. It will also undertake a risk analysis of all projects for which commencement notices are received, which will inform each building control authority’s own inspection arrangements, thus ensuring that available inspection resources are used to optimum effect. Briefing and guidance for local authority staff on the new system has begun in recent weeks and arrangements are being made to brief industry stakeholders in early February 2014 before the system is made publicly available in advance of 1 March 2014. A new code of practice for inspecting and certifying works will guide and assist construction professionals in particular in dealing with their new obligations in inspecting work during construction, lodging documentation to demonstrate compliance and certifying the design and construction. Professionals who comply with the code of practice will be deemed to have fulfilled their obligations. This code of practice has been prepared in close collaboration with industry stakeholders and circulated widely within the industry. Standard forms of contracts used for both private and public sector projects will need to be revised to reflect the new regulatory environment. I understand that the Government construction contracts committee is currently reviewing arrangements in this regard with public works projects. My Department also understands from its ongoing liaison with the key construction professional bodies representing architects, engineers and surveyors that this work is advancing well. My Department officials are available to advise and assist the professional bodies in this regard as necessary. Concerns that the new regulations prevent a self-build situation are unfounded, although all house builders must comply with the new regulations. An owner who intends to self-build will, as before, assume legal responsibility for ensuring that building or works concerned are compliant. The new regulations now require all owners to assign a competent, registered professional to certify the design and to inspect and certify the works. Confidence in the builder will be a key factor influencing a professional’s decision to accept these roles and owners who intend to self-build will need to be aware of this. I am satisfied that arrangements for a smooth transition to the new regulatory environment are well in hand and my Department will continue to work with all parties to ensure they understand their obligations and the steps necessary to meet them. I understand from representations I have received from the Senator and others that there is some concern about people who are not registered with professional bodies but who are draughtsmen or have carried out work on behalf of architects over the years. I have asked the chairman of the admissions panel of the Royal Institute of Architects in Ireland, Mr. Garrett Fennell, to consider the routes to recognition of those people in respect of professional bodies. A report should be on the Department’s website that clearly indicates the recommendations for changes to be made, and I have accepted Mr. Fennell’s report in full. I hope to be in a position to implement those changes as quickly as possible, and that will provide an opportunity for people who are worried about their future, as there will be new rules regarding technical assessment. For example, there is a short and inexpensive course in UCD that will help these people. I have asked the RIAI to examine how we can assist people in becoming fully registered and in any other way in achieving that goal. These applies, as the Senator correctly suggests, to people who have been working in the system for many years. I hope that by implementing the recommendations in Mr. Fennell’s report we will be in a position to drive down costs and improve the opportunities for recognition for the professionals involved in building and construction for many years. The Minister did not expand on the methodology used by the Department to exclude other professionals from the register of competent professionals in his answer. The final version of the code of practice is still not available (at time of writing) a month before implementation. “Having regard to the concerns expressed by the RIAI in the letters of 21 November 2013 and14 January 2014, having regard also to the extraordinary tight timescale to complete and road-test the local authority infrastructure for the Regulations, and having regard, finally, to the state of readiness of the construction industry – the RIAI considers that, pending satisfactory resolution of the outstanding issues, members should be cautious to ensure that they can act within their competency prior to accepting appointments as ‘Design Certifier’ or ‘Assigned Certifier’ under the Regulations. Note that the ‘Assigned Certifier’ role is a separate appointment to that of ‘Architect’ and that the necessary documents (Contracts in particular) have not been amended yet to account for the impact of the new Regulations. The RIAI is a key stakeholder and has a crucial role in the implementation of this legislation. Earlier this month the President of the Architects organisation the RIAI wrote to the Department of the Environment requesting a deferral of SI9. Below is the RIAI letter sent on 15th January 2014 to Minister Hogan. 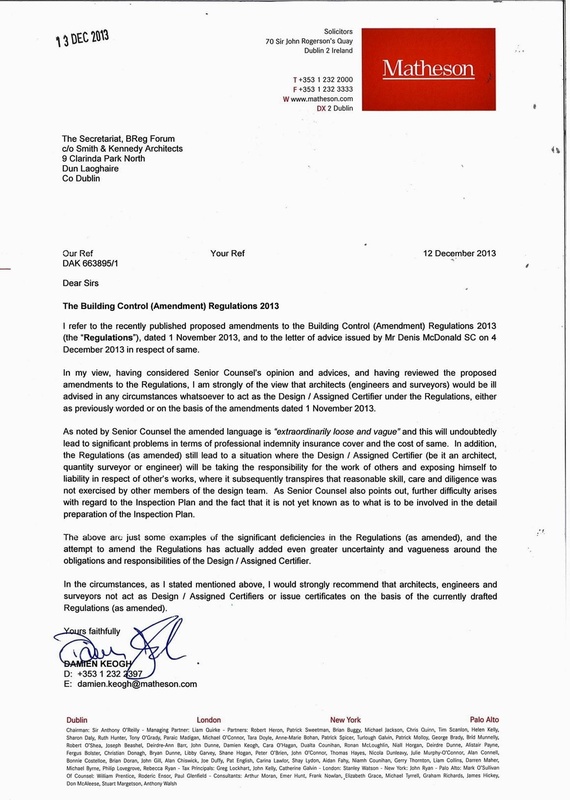 Minster Hogan’s refusal is attached dated 16th January 2014. The new SI9 was subsequently signed by the Minister. The RIAI are a key stakeholder in the formation and implementation of SI9. Political Q+A: Claire Daly: Revoke Building Control Amendment Regulation (SI.9 of 2014)? The Minister’s answer to this question makes no reference to the submissions and representations made by the victims of the very failures these new regulations were targeted at. Priory Hall and the Pyrite scandal are frequently mentioned in this context by the Minister and the Department. The Government commissioned Pyrite Report is a thorough investigation into the problem of pyrite in up to 12,000 homes and was completed in 2012. The report was endorsed by the government and published. Several key recommendations address Building Control and how to prevent the future devastation to homeowners and families have been ignored by the Department and are excluded from SI.9. Question No. 140 – Clare Daly. To ask the Minister for the Environment, Community and Local Government if he will revoke statutory instrument no. 9 in relation to building regulations, due to come into effect on 1 March 2014 , as the mandatory certification by an architect or similar professional will increase costs and will not improve standards, and instead to revert to the system of oversight by local authorities as enforcement action is the only way to avoid some of the appalling breaches of regulations that took place over the past number of years..
Local authorities have extensive powers of inspection and enforcement under the Fire Services Act 1981, the Building Control Act 1990 and the Planning and Development Acts and they have used such powers on a number of occasions in recent times in order to address instances of serious non-compliance with fire and safety requirements in homes and buildings. These powers of inspection and enforcement are separate and distinct from the requirements of the Building Control Regulations which put in place the administrative arrangement by which owners, designers and builders are required to demonstrate their approach to achieving compliance with the Building Regulations. The Building Control (Amendment) Regulations 2014 and I am satisfied that these will greatly strengthen the arrangements currently in place for the control of building activity, by requiring greater accountability in relation to compliance with Building Regulations in the form of statutory certification of design and construction, lodgement of compliance documentation, mandatory inspections during construction and validation and registration of certificates. The new regulations are necessary following the widespread instances of failure by owners, designers and builders to comply with their statutory obligations under the Building Control Act 1990 to design and construct buildings in accordance with the building regulations. The regulations will be administered electronically through a new online Building Control Management System which will enable building control authorities to undertake a risk analysis on each commencement notice received and to target their available resources towards building projects where the risk of failure to comply is highest. Political Q +A: Pearse Doherty: The financial burden of Building Control Amendment Regulation (SI.9 of 2014)? An extensive public consultation process was undertaken in 2012 to inform the development of the revised building control regulations which will come into effect on 1 March 2014. Comprehensive consultation documents were published including Strengthening the Building Control System – A Document to inform public consultation on Draft Building Control (Amendment) Regulations 2012 which sets out the context in which the reforms – as later signed into law in the form of S.I. No. 9 of 2014 – will operate and the regulatory impact of these for building owners and industry stakeholders. This document remains available on my Department’s website. The costs of construction activity and related professional services are determined by market forces and I am precluded by trade and competition law from introducing any measures which would interfere with the normal functioning of the market in that regard. Despite over 500 stakeholder submissions on SI.80 of 2012 received by the Department no proper Regulatory Impact Assessment (RIA) was carried out. It appears also that no RIA was carried out on the radically different March 2013 wordings of SI.80 or the final version SI.9 of 2014. These contain wording which is “extraordinarily loose and vague” and has serious legal implications for professionals undertaking the new certifier roles according to a number of Senior Council opinions. Given the extraordinary costs to be borne by the consumer every year and the anti-competitive nature of the builder’s completion certificate wording (and the proposed register of builders) we find the Minister’s last statement remarkable. Self-builders alone could be paying €23,000 extra each or €115m in total this year alone to build their own houses when SI.9 comes into effect in March. There is a good example of how one might assess building control amendments. The “Communities and Local Government: Proposed changes to the building control system – Consultation stage impact assessment” report was produced in the UK in 2012. You can read it here. It is a 41 page dense document that comprehensively examines several options to revise and change the UK building control system. It examines numerous alternatives but discounts self-certification quite early on due to excessive cost to the consumer and industry. Political Q+A: Olivia Mitchell & Tommy Broughan: The Self-Builder Question? To ask the Minister for the Environment, Community and Local Government if his attention has been drawn to the submissions from a group (details supplied) about the certification requirements contained in the Building Control (Amendment) Regulations 2014; and if the regulations will be amended to reflect the concerns outlined by the group in question. 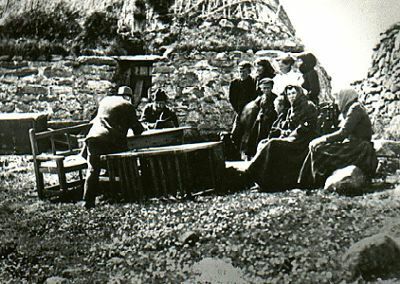 To ask the Minister for the Environment, Community and Local Government if he will reconsider the proposed amendment S.I number 9 of the Building Control Amendment Regulations 2013 which if introduced could discourage the tradition of self builders here; and if he will make a statement on the matter. For WRITTEN answer on Tuesday, 28th January, 2014. I propose to take Questions Nos. 544 and 554 together. The new Building Control Amendment Regulations which come into operation on 1 March 2014 will greatly strengthen the arrangements currently in place for the control of building activity by requiring greater accountability in relation to compliance with Building Regulations in the form of statutory certification of design and construction, lodgement of compliance documentation, mandatory inspections during construction and validation and registration of certificates. The new regulations are necessary following the widespread instances of failure by owners, designers and builders to comply with their statutory obligations under the Building Control Act 1990 to design and construct buildings in accordance with the building regulations. These obligations apply to all sectors of the housing market, including the self-build sector. Neither the Building Control Act or any regulations thereunder, including the new Building Control Regulations , place any restrictions on whom an owner may assign as a builder once the owner is satisfied that the builder is competent to undertake the works involved. An owner who intends to self-build will assume responsibility for ensuring that building or works concerned will comply with the requirements of the second schedule to the building regulations. They must undertake to do everything necessary to achieve this and to ensure they are in a position to certify the building or works on completion thereby taking legal responsibility as builder. The new regulations also require an owner to assign a competent, registered professional to certify the design prior to commencement and to inspect the works during construction so that the assigned certifier is in a position, in conjunction with the owner-builder, to sign a certificate of compliance on completion. A building project cannot proceed until such assignment s (which may be one and the same person) ha ve been made. Confidence in the builder will be a key factor influencing a professional’s decision on accepting a role as assigned certifier , in particular, and owners who intend to self-build will need to be aware of this. My Department will be happy to liaise with the Irish Association of Self-Builders in relation to their concerns and to assist them in understanding their obligations in the context of the new regulations. The Building Control Amendment Regulation (SI.9 of 2014) comes into effect on 1st March 2014 and will apply to all new houses or extensions greater than 40 sq meters on which work is due to commence after that date. The regulations place an obligation on the owner of a building to appoint a competent builder to undertake the works and to give notice to the Local Authority of the name of that builder before the work starts. The builder is required to submit an undertaking to the Local Authority that he is competent to undertake the works and to ensure that anyone he employs will also be competent. He also undertakes to the Local Authority to build the building in accordance with the design and to follow the inspection plan and that he will certify that the building or works will comply with the building regulations, when it is complete. 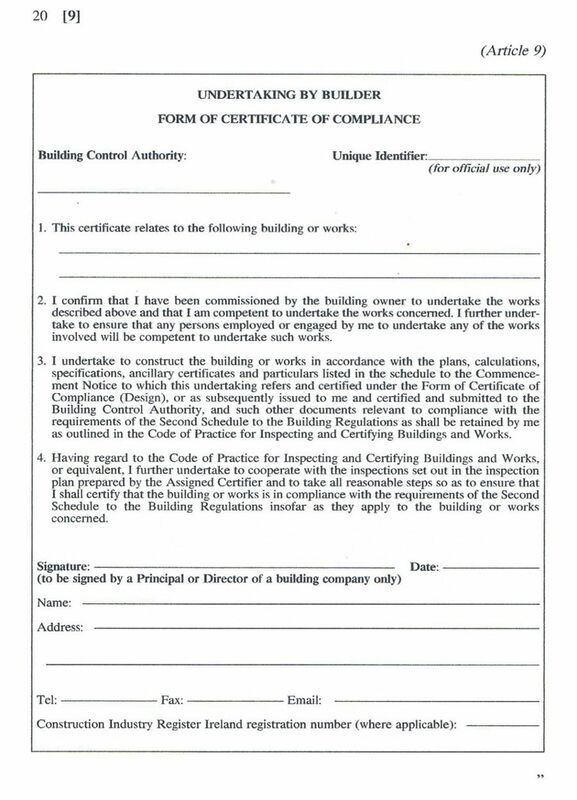 At the completion of the works the builder has to sign an undertaking known as the certificate of compliance on completion confirming that the building has been completed in accordance with the plans calculations, specifications etc and that the building complies with the Building Regulations. The extract of SI.9 of 2014 of the Builder’s certificate of compliance is shown below- It will be noted that the certificate is “to be signed by a Principal or Director of a building company only” under the signature for builder, making clear the intention of the legislation. • An acceptable record which demonstrates compliance with regulatory requirements pertinent to the industry. The Government has made it clear that it supports the CIF in establishing this register and has, by implication, accepted the standard which has been set. There is little possibility that the majority of self-builders will meet this level of compliance. Against this background It is then surprising to note the answers to questions by Tommy Brougan TD and Olivia Mitchell TD which were made to the Minister Phil Hogan on behalf of the Self-Builders on Tuesday 28th January 2014. It would appear that the Minister does not concur with the Department’s/CIF’s interpretation of SI.9 and his statement suggests the explicit wording above on the Builder’s certificate of compliance places no restriction on owners to nominate themselves in this role. This difference of opinion between the Minister and those that will be implementing SI.9 should be of great concern to the 5,000 self-builders who this year may embark on probably the largest single investment of their lives. The Minister has now confused the matter by saying that there is “no restriction on whom an owner may assign as a builder once the owner is satisfied that the builder is competent to undertake the works involved.” By definition most self-builders will not be “competent” in accordance with the standards adopted by the CIF and supported by the the minister’s department. There is no possibility that they can comply when the CIF’s register is formally adopted as part of the statutory process. A number of senior councils have reviewed the current and previous versions of Building Control (Amendment) Regulation (SI.9 of 2014)- previously SI.80 For clarity we table the most recent opinions with the most recent wordings in reverse chronological order. These are presented without comment. There are two senior council advice notes on the December 2013 wording, substantially the same as SI.9 which has been signed in January 2014 by the Minister and is due to come into effect on 1st March 2014. One is by Mr Gavin Ralston SC (commissioned by RIAI) with statement by Hayes Solicitors and one by Mr Dennis McDonald SC with a cover letter by Matheson Solicitors (commissioned by 7 past presidents of the RIAI). There is no current opinion by ACEI available as yet; if one becomes available we will post this also. Below are the links to both Senior Council opinions, the Matheson and Hayes Solicitors statement and letter and also the current wording of SI.9 0f 2014 as recently circulated by the RIAI. An earlier Opinion has been commissioned by the Construction Industry Federation but is not in the Public Realm. Irish Water-a lifeline for Building Control? During the debate concerning the Building Control (Amendment) Regulations (SI.9 of 2014) a lot of commentators, this blog included, have dug up statistics showing the low numbers of site inspections, understaffing levels at local authority building control sections etc. We acknowledged a number of hard-working fire officers double-jobbing at building control to help out. However we also were quite critical noting that just a few years ago some areas of the country received less than 2% inspection rates from local authority building control. Some received none at all. What was overlooked was the rather impressive performance targets set by the Department and the County Managers for the Building Control Officer (BCO). A rate of 15% site inspections has been the target for some years for building control inspections nationwide. In their wisdom the Department has set this figure which has been passed down by the head of each local authority, the county managers to their staff. Let’s look at this for one moment. Recently Tom Parlon in an RTE interview was very upbeat about the construction industry output for this year 2014 increasing for the first time in years to €11.5bn. A 15% inspection rate of a €11.5bn industry, for 67 staff, equates to one Building control officer inspecting €171 Million worth of buildings per year; for each officer!. That ranges from once-off houses, kitchen extensions, retail parks, stadia, shopping centres, places of worship- the lot. That’s a pretty impressive target. During the “celtic tiger” years this figure was three times that. I wonder are there any performance targets as ambitious as those set for any other public servants? For Irish Water? We have estimated previously the number of full time inspectors needed to staff a properly resourced local authority building control inspectorate at around 300. This would match the UK provision (based on output) and achieve 100% inspections. That’s around 230 new personnel on top of the depleted 70 or so already desperately under-resourced and overworked BCO’s. Apparently Irish water are over-resourced by over 2,000 staff. Many of these are experienced civil engineers with years of site inspection experience that could quickly and relatively easily be upskilled. Why not, just to get the system up and running, employ 500 additional BCO’s, just in case we’re out on our calculations. We seem to have the personnel. According to Tom Parlon 1 in 4 on the dole are ex-construction sector workers so one could assume the BCO posts could rapidly be filled. Could there possibly be help very close to hand for the poor overworked BCO? Could an independent local authority building control section capable of 100% inspections nationwide be that easy to establish quickly and with little expense? Could the consumer get proper independent regulation of the construction industry for the first time in 22 years? Perhaps some of the experienced site inspectors in Irish Water could be “diverted” into Building Control Sections one wonders? The above opinion piece was submitted by Maoilíosa Mel Reynolds on 29th January 2014. The following post is a personal viewpoint of UK and Ireland trained architect Mark Stephens RIBA MRIAI. The UK Building Control model and Approved Inspectors would definitely work in Ireland, in fact I think it has now become a necessity. If Priory Hall has taught us anything it’s that self-regulation does not work – we need a third party to inspect the work of others, both designers and builders. In the UK this falls to either the Local Authority Building Control Officer or to an ‘Approved Inspector’. This Approved Inspector is licensed and liable to sanctions for negligent performance; the Approved Inspectors were also introduced a long time after the Local Authority model (1984 as opposed to 1965). 1. By initially adopting the system through the Local Authority the system can be introduced, tested and verified prior to an alternative system. 2. 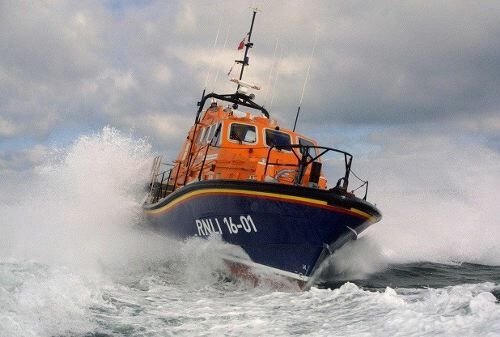 This is the easiest route to adopt in terms of existing skill sets and work flow; there are already Building Control Officers or Fire Officers in Ireland that can be utilised in expanding their existing roles. 3. Why should Local Authorities continue to absolve any responsibility on the construction of buildings in their locality. As well as the legislation for the Approved Inspectors themselves, the Approved Inspectors in Ireland should also need to be given powers to alter or remove work that does not comply with the Building Regulations; this type of enforcement exists for UK Local Authorities (under the 1984 Building Act) but not for UK Approved Inspectors. Therefore the register of Approved Inspectors can be introduced at a later date (following the Local Authority model) together with any required legislation. In terms of architects taking on the role of Approved Inspector; they are ideally placed with regards to training as they are obviously skilled in construction and Building Regulations. However, the Building Control Officer (often now called Surveyor) should be regarded as a completely different profession and the requirements of jumping from architecture to Building Control should be carefully considered. The skill-sets acquired by the architect will definitely be of benefit but it should be realised that the inspection and certification role that would normally be undertaken on your own projects now need to translate to projects by other professionals. This requires the Building Control Officer to compile and keep accurate records, reports, diagrams and drawings for projects designed by others. The architect needs to ask themselves whether they would prefer the role of the Building Control Officer (which I am not denigrating in anyway – I have great respect for their qualifications, training, skills and experience) or to remain as an architect. Obviously if this were to be introduced in Ireland it could be an additional revenue stream for the architect, personally I prefer to undertake the work of an architect. Interestingly, if you look at the UK register of Approved Inspectors, there doesn’t appear to be any that have run or are still running architects’ practices – If I am incorrect about this please correct me. Again this is testament to the Building Control Officer being seen as a separate profession. The architect should also bear in mind the full role of the Building Control Officer includes aspects of the Building Regulations that may be undertaken normally by other professionals in their everyday work such as a full understanding of foundation/structural design and compliance with Part L via DEAP. You however may feel differently and if I would encourage you if you felt that this career path is your ‘calling’; all I am saying is that if you are an Irish architect contemplating this as a career move (should it be introduced) then think long and hard about the implications. The demise of building your own home in Ireland under 2014 Regulations (S.I.9 of 2014). Owning your own home in this country is a tradition that is well established and part of our DNA. Self-building for many is the only realistic way of achieving this. Industry estimates suggest that self-building comprises over 60% of all houses completed in Ireland. So for 2013 of the 8,000 houses that were completed, almost 5,000 were self-built. These are houses built by normal people, at their own speed, the biggest investment most will make in their own lives. Stretching scarce funds to build the best house they can for themselves. The average standard of self-built house is well in excess of the current minimum standards offered in the “built for sale” market. Most self-builders do so out of financial necessity. Its a steep learning curve but with the appropriate professional input (engineers, architects etc) it can minimise surprises and shocks. It can be a difficult process but all who do it will say it is certainly a memorable experience! Under SI.9 established builders must now be used in all residential projects over 40SqM. If a self-builder elects to do this role they will be deemed not compliant with the building regulations and may not be able to re-finance or sell their house later on. How much extra will a self-builder have to pay now under this new regime? Recent estimates from professional sources suggest the extra professional fees for SI.9 would be in the region of €5000 for engineers, building surveyors and architects. However these are only extra professional charges. On a typical €180,000 house a contractor’s “management fee” would range from between 5- 10% of the construction cost. There are also preliminary costs (scaffolding, site facilities) along with other costs. A conservative estimate for using an established contractor would be €18000. So the total cost of SI.9 from March 1st for a self-builder (professional fees + contractor costs) could be €23,000 or 12.8% of the total build cost. A huge additional cost for a sector trying to get value for money. For 5,000 self-builders this year alone the extra cost to for these ordinary people building their own homes could be €115 million euro. Key stakeholders and professions involved in the formulation of SI.9 have called for deferral of the legislation stating that there will be no benefit to us, the consumer. Under SI.9 the industry will remain self-regulated. €115m extra for no benefit- self-builders are the silent majority affected. That is a lot of votes in the next local and general election. Politicians better take notice. The above opinion piece was submitted by Maoilíosa Mel Reynolds on 28th January 2014. There has been a lot of fractious debate and arguments particularly in the professions regarding SI.9. The Minister has signed the regulation in the face of repeated calls for postponement from key stakeholders involved in the creation of the regulation. The Department also disregarded consumer representations from the likes of pyrite owners and Priory Hall residents, the two poster children in the campaign to introduce the regulations. Now as the dust is settling and before our Minister heads for Europe let’s look at the people left behind, the winners and losers of Building Regulations (Amendment) Regulation 2014 (SI.9 of 2014). 1. Consumer: There is an extra cost per house of possibly up to €15,000 for professional fees (RIAI estimated 156- 200 hours minimum per house for certifier roles) excluding additional duties from contractors with little or no consumer benefit. This excludes the cost of “defensive” specifications which industry estimates at an additional 5% on top of construction cost also. The construction industry is still unregulated and relies on a reinforced system of self-regulation. Like pyrite affected owners consumers will still be left to seek redress in the high court after faults discovered. No improvement in technical standards, no improvement in consumer protection. Definite losers here. 2. Professionals: Engineers, surveyors and Architects (not Architectural Technicians) can enjoy greater paperwork and fees from most projects. At a price as regulations carry “untenable liability” for professionals who want to undertake these roles and write guarantees for others work. There may be risks of not being able to obtain professional insurance later on. There have been a number of very detailed and alarming senior council opinions on various drafts of SI.9 (previously SI.80)- see Matheson Solicitors summary advice letter of 12th December below. So more fees and more liability with increased insurance costs. On balance neutral. 3. Legal profession: Not really mentioned to date but there was a recent conference of newly founded Construction Bar Association in November 2013 discussing opportunities that the upcoming legislation would be offering. The “extraordinarily loose and vague” language in the regulations may need to be clarified in court, so expect more high court cases involving building surveyors, engineers, architects and consumers in the next few years. See MrDenis McDonald SC legal advice of 4th December below. Increased volume of construction high-court cases makes the legal profession definite winners. 4. Contractors: Still no mandatory register for contractors so status quo here. As SI9 now requires all work to be certified by the principal of a building firm self-builders will no longer be able to manage qualifying projects on site from March 1st onwards. Based on industry estimates contractors will now have an extra 1,200 houses on their books. For a typical €200k house the contractor’s management fees and charges could be in the region of 12% of the construction cost or €24k. No mandatory register and nearly €240m in additional turnover with €28m profit- top of winners section here. 5. Self-builder/farmers/ consumers: A silent majority self-builders account for over 60% of all homes completed in any year. As self-builders now need to employ a contractor as well as additional certifiers under SI9 they have to fork out up to €40,000 per typical house for the privilege. Over 22% extra on top of the construction cost. Every farmer who planned to build a house on his/her land for their children will be affected. Farmers building most agricultural buildings, even those only for storage of machinery, will find most works qualify under SI.9. Despite numerous Ministerial assurances to the contrary, self-building is “problematic” due to a lack of willing certifiers. Recent Law Society guidance recommends professionals not to certify self-build projects. IAOSB estimate 30% of all self-builds will be abandoned in an average year. Self-builders are no question the biggest losers. 6. Political cost: hard to estimate. Consumers in general may gradually see no improvement with more scandals like Priory Hall and Pyrite hitting the papers in years to come. More insurance companies will contest claims, more consumers left hanging out to dry trudging through the high court with no guarantee of success. However a large cohort, self builders, will feel the sharp end of SI9 this year and every year following. That’s thousands of votes, plus partners & families every year. Looks like business as usual wins the day again. The above opinion piece was originally submitted by Maoilíosa Mel Reynolds on 27th January 2014- updated on 21st April 2014. 1 The State should not primarily be liable for the cost of building control nor should the State be liable for defects in construction. 2 Concerns have been expressed that S.I. 9 of 2014 will not protect the householder in the way it sets out to. In 2012, submissions by non-construction sector stakeholders (NCA) and the Pyrites Panel said that an inspection system independent of the designer and the contractor is needed. 3 There is a wide consensus across consumer organizations and in the media, supported by World Bank and European Consortium of Building Control studies, that self-certification as in S.I. 9 will not work, particularly for speculative residential development. It works in no other sector of the Irish economy and is even less likely to work in construction. 4 At the same time, the unintended consequences of S.I. 9 for non-residential projects, especially complex projects (e.g., hospitals) and FDI projects are such that the system increases costs and uncertainty unnecessarily. 5 What is needed is a simple measure to improve and sustain the quality of design and construction, particularly with speculative residential development. 6 This should be backed by compulsory latent defects insurance to guarantee redress to consumers in the case of the small number of residual defects that will occur, or in the case of financial failure of a development/construction company. 1 Replace S.I. 9 of 2014 by a new statutory instrument. 2 Set up a register of “Approved inspectors”, answerable to the building control authority. 3 This register to be open to architects, architectural technologists, appropriately qualified engineers, and building surveyors, with appropriate qualifications and adequate experience. Admission to be competence-based, with knowledge of building regulations, building control regulations, and building construction. 4 The Approved Inspector to carry an appropriate level of professional indemnity insurance. 5 To start with, the system to apply in the speculative residential sector and to the one-off (“self-build”) house. 6 The Approved Inspector audits the design for compliance with building regulations, and inspects the construction works for compliance with building regulations. 7 Inspection of designs would include Parts B and M for one-off houses. Pending review, fire safety and disability access certificates would still be required for apartments. 8 The design team must still prepare full designs and inspect the works as at present. The contractor must build in compliance with the building regulations as is routinely done on well-organised buildings. The Approved Inspector issues reports to the Local Authority at the start and completion of construction, confirming that he has inspected the design and construction and found nothing wrong. 9 If the Approved Inspector finds non-compliant design, he refuses to issue the Design Certificate until he has been given amended design drawings. Given that the architect will have to explain any such delays to his client, the architect will make sure the designs are right in the first place. This raises design standards. 10 If the Approved Inspector finds non-compliant construction, he tells the contractor and the architect, and he has the ultimate sanction of being able to issue a “Cease Works Notice”. He will refuse a Completion certificate until the matter is put right. 11 The Approved Inspector inspects 100% of designs and 100% of sites. On top of this, the building control authority risk profiles risk, and inspects a small number of designs and building works as indicated by its risk analysis, to ensure that the overall system is working properly. 12 If the Approved Inspector is negligent, he can be struck off the register and can be sued. 1 This system resembles the system of independent auditors of company accounts. A company has an internal accountant. The independent auditor inspects the annual accounts and signs off on them. The accounts are lodged to the Companies Registration office. The auditor is paid for by the company and is answerable to the State. The auditor is not responsible for the complex task of preparing the accounts in the first place: his sole task is to check for financial probity. 2 A developer wants to build a building. The Approved Inspector inspects the design and the construction and signs off on them. The designs are lodged at the Building Control Authority. The Inspector is paid for by the developer, and is answerable to the Building Control Authority. The architect, engineer and builder have the complex task of designing and building the building; the inspector’s task is to focus exclusively on building regulations compliance. 3 This Approved Inspector system resembles the “Approved Inspector option” in the building control system in England and Wales. The system is also the same as that in Northern Ireland except that here, the Approved Inspector, answerable to the local authority, substitutes for the N.I. building inspector in local authority employment. 4 Why is this system better than that in S.I. 9? 1 The cost to the State is minimal. The developer pays the fee of the Approved Inspector. 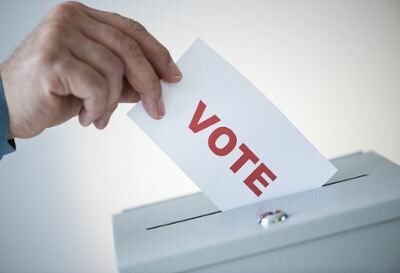 The only cost to the State is to maintain the register and monitor the operation of the system. This could be funded through an appropriate licence fee. 2 The learning experience for a young architect of having their designs audited by an experienced architect or engineer will be intense and immensely fruitful. This will drive better design standards. 3 The learning experience for a contractor is to have the experienced Approved Inspector arrive on site, who has inspected many sites and knows what to look for, concerned with nothing except building regulations compliance, with local authority backing. 4 The system is better for the State. It will better design and construction, not just better paperwork. 5 It gives the State an additional layer of protection. The Approved Inspector with annually renewed and proven professional indemnity insurance stands between the building defect and the exchequer. 6 The system has the capability of solving concerns relating to experienced architectural technologists whose livelihoods are undermined by S.I. 9. 7 It solves the self-builder issue. The system gives the self-builder a straightforward independent inspection system which he pays for, the same as anybody else. If his designs are good enough – they pass, at no cost to him. If they are not good enough, he must prepare an adequate design, the same as anybody else, however he chooses. If his building is good enough when the Approved Inspector arrives – that is fine. If not, the self-builder must rectify the defects, the same as anybody else. 8 It solves the FDI issue. S.I. 80 was introduced to solve problems in the residential sector but affects all construction projects of any significance. By revoking SI 9, it allows the technologically advanced FDI project (e.g., “Intel”) proceed under self-certification, as is better for many reasons. 9 The system requires no change to construction contracts and hence will not cause delays in the construction sector. The Approved Inspector operates independently of the contract administrator (Architect or Engineer) and has statutory authority. 10 The system is better for the consumer: per the submission of the National Consumer Authority, this will give better results than a system of self-certification. 11 The system protects the consumer from loss with a no-fault system of redress and no litigation is needed. 12 The person who buys or rents a new home gets independent third-party audit by experienced professionals, answerable to the local authority. 13 The system is better for the construction sector: as it will drive higher standards through dedicated experienced inspectors who with larger and recurring workloads will feed-back into better design and better building. 14 Through feedback to the local authorities of the inspectors’ experience across many designs and sites, systemic problems will be spotted earlier. 1 A system as outlined above can be set up quickly. It involves no major change in existing contractual and legal structures. It needs no primary legislation: the Building Control Act already provides for the designation of such persons to act in this capacity. 2 Such a system will have the support of the consumer organisations and the public. Michael Collins and Eoin O Cofaigh, Presidents 1986-1987 and 1998-1999, Royal Institute of the Architects of Ireland. Written in December 2013 and references to SI80 have been replaced with SI9, 2013 has been replaced with 2014. Content appicable to SI9 and SI80. The other arm and leg: actual cost to consumer of 2014 Regulations (S.I.9 of 2014)? Industry estimates for the extra cost of SI9 have varied considerably. Consumer bodies and the Department suggest an extra cost for a typical house of between €1000 to €3000 (source: NCA Submission 2012; RIA 2012). Industry sources now suggest the real world cost of SI9 is conservatively at the upper end of this scale, possibly up to €5000 per dwelling for all professional fees. A €3000 extra cost on a €175,000 new-build once-off house is a little over 1.7% extra on the construction cost. Not much but in the macro context the total cost to the consumer for say 10,000 house completions in a typical year will be €30m. When we get to a “sustainable” level of house completions of 25,000 dwellings per year this will have risen to €75m. Quite an amount for little or no extra consumer protection. In the commercial sectors industry estimates currently vary due to building type, level of complexity etc. However estimates based on the UK model would suggest an extra cost of between 0.5% to 1% of the construction cost of a project as a reasonable range. Tom Parlon’s recent estimates on RTE suggested an increased construction sector output this year of €11.5Bn. This puts the cost for 2014 of SI9 at around €100m. This certainly puts the recent charity sector pay scandals and Irish Water consultant’s fees into perspective. The big difference is that SI9 will be a recurring cost to the consumer. Has a proper cost/benefit analysis been done on this? An arm and a leg? How much for Independent building inspectorate? Recent calls by the RIAI and the Institute of Chartered Surveyors for postponement of the upcoming Building Control Amendment Regulations SI80 in March and the establishment of a comprehensive building control inspectorate seem badly timed. Given the costs for the establishment of Irish Water the how much will a local authority system of comprehensive building control cost us? Let’s look at the costs of a good system of Building Control for a moment. 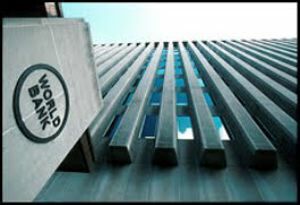 The UK ranks 27th out of 182 countries for “ease of obtaining construction permit” according to the recent by the World Bank Report mentioned recently by Minister Richard Bruton. Their legal and system and building standards are closest to ours so they are a good precedent to look at. How much would it cost us to establish the similar system here? There are over 3,000 local authority building control inspectors (source: Local Authority Building Control UK) with an additional 600 private licensed Approved Inspectors (source: Construction Industry Council UK). Approved Inspectors complete 20% of all building control inspections in the UK (source: World Bank). So we have a conservative total of 4,000 Building Control inspectors in the UK. In the UK the current construction industry output for 2012 was €115Bn with Ireland at €7.5Bn (source: Bruce Shaw). Given our construction output is just 6% that of the uk the consequent number of inspectors required should be 270. In 2007 we had less than 70 for the entire country so by employing 200 new inspectors we should have coverage similar to the much praised system in the UK. A simple and viable system for us would be to have an existing local authority building control officer co-ordinate 4 new private licensed suitable qualified professionals who would be out on the road doing inspections. The costs for these new inspectors would be paid by new fees to developers/ builders (e.g. €370 per dwelling). The system would be self-funding, transparent and effective. 100% independent building control inspections throughout the country, real consumer protection. There would be plenty of well-qualified applicants for these roles and a separate simple register could be set up to monitor 200 professional inspectors. No millions of euros in consultants fees needed to work out the feasibility or costs. The recent revelations concerning consultants’ fees paid by Irish Water of €50 million is an interesting one. On the one hand we have local property tax which initially was to go towards funding local authorities, now going almost entirely to capitalise Irish Water. No doubt this will allow this essential public resource then to be sold off to a private consortium in the short term. On the other hand we have local authorities who will now be strapped for cash to do essential repairs and maintenance of the infrastructure to which they are responsible. The cost of a proper independent building inspectorate for the average house in the UK is €370 per dwelling (£300). This cost is almost self-funding and comes at minimal extra cost to the UK taxpayer. Given the recent figures for house completions in Ireland for 2013 at 7,500 this would suggest that the €50 million spent on consultants by Irish Water would fund 18 years’ worth of inspections by local authorities in a new comprehensive building control regime. That’s 100 per cent independent building control inspections for every house in Ireland for free for nearly two decades. I wonder which is better value? The recent calls by construction industry stakeholders for postponement and amendment of the Building Control (Amendment) Regulations SI80 appear to be badly timed. Major stakeholder and consumer groups have stressed the industry is not ready and have called for a comprehensive system of local authority (or licensed inspectors) similar to that in the UK. One hundred per cent independent inspections for all buildings completed in the State would give complete consumer protection and finally independently regulate the construction sector. The Government response has been lack of funds – we don’t have them and we must do more with less. This would not appear to be the case however. New RIAI Council Policy with regard to the Building Control (Amendment) Regulations SI9 (as revised) adopted on Friday 17 January 2014. Policy Adopted by RIAI Council with regard to the Building Control (Amendment) Regulations (as revised), was adopted on Friday 17 January 2014. 1. We have asked (and we ask again) that the implementation date of the 1st March be postponed because systems and documents are not ready for implementation. 2. Self certification as set out in the SI, especially in the speculative residential sector, cannot be relied on to protect householders. 3. An appropriate system of LDI must exist alongside the Regulations, initially for the Residential sector. 4. A statutory Register of Builders must exist alongside the Regulations. 5. Legislation facilitating the putting in place of adequate enforcement mechanisms (including ADR) must be prioritised. 6. The documentation relevant to the consumers’ (legitimate) interest in a building or property should be readily available. The above opinion piece was submitted by Maoilíosa Mel Reynolds on 9th January 2014. Piece was edited on 27th April 2014. In the United States local governments implement and enforce building codes. This report looks at the utilization of a third-party code enforcement program as a potential cost saving measure. A private sector company verifies compliance with building codes on behalf of the government regulatory agency. The report includes an overview of a comprehensive third-party program and recommendations for establishing such a model. It also features jurisdictions with successful third-party enforcement programs, as well as companies that provide building department services across the U.S.